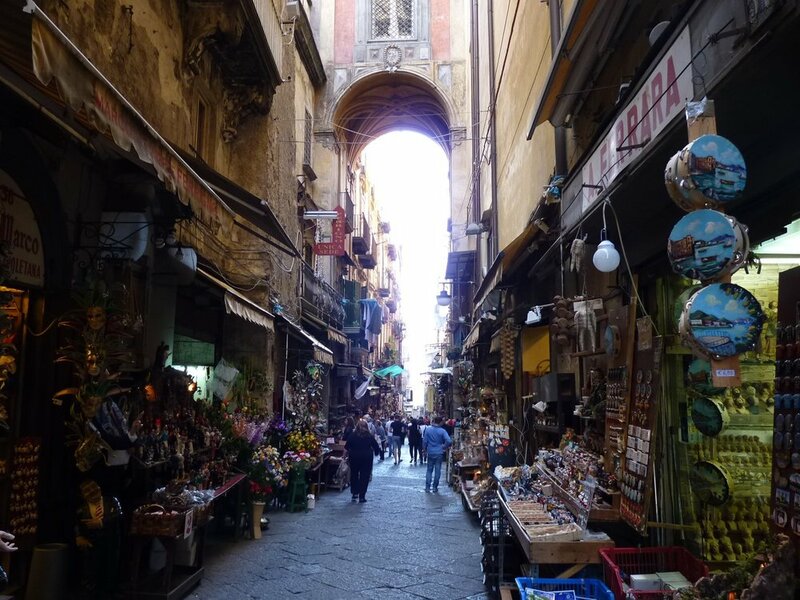 Naples is not the first place you think of going when you hit Italy, or the second, third, fourth, or maybe even fifth; hell, many people would see all of Northern Italy before hitting Italy’s red-headed step-child of a city (I mean this most affectionately). Well I’m here to tell you that if your 2-3 week trip in Italy does not include Naples, you have planned poorly or simply are not interested in seeing what Italy really has to offer. A complete opposite to the meticulously lined and polished landscape of Tuscany, Naples is in a mountainous, sort of sprawling strip of coastline in the shadow of Mt. Vesuvius, a couple hours train ride from Rome. Naples is a disappointment to see on the train/bus upon arrival, as the outskirts of the city are mostly factories and ugly high-rise buildings made of concrete. When we got to Naples, a very nice man explained where we were to catch our bus back to home and was a bit shocked we were from the States, stating: “America! Why are you HERE, mamma mia! ?” At this point Jess and I thought we were pretty much going to get mugged any minute and our short walk to the station did not change this perception as it looked a little like a demilitarized zone. We arrived at Garibaldi station and started our way to our hostel/hotel. As we exited our metro (after getting a little lost due to the rather unintuitive and completely unsigned metro system) we entered Dante plaza, a large open space with a triumphant looking Dante and our first introduction to the old city. We walked down the Via Toledo and were immediately shocked: It was crazy; people everywhere, garbage, graffiti, countless shops, teeming and electric. We made it to our hostel, which like all the buildings was mid-collapse, and settled into out tiny room before embracing the streets. Our first destination: Pizza in the old city, as Naples is the birthplace of the glorious pizza (which by the way was considered filthy and disease causing by the upper crust [pun intended] Italy’s past as it was made in the poorest part of Naples). We traveled through the old city to our first real pizza experience at Sorbillo, the only pizzeria in the world to have a Michelin star. After the 45 minute wait, a common wait time for tourist and Neapolitans alike, we entered the crowded dinning room and ordered. They have many pizzas, one beer, one or two kinds of wine, and are pretty short on patience. We got the margharita and one with toppings and the result: Better than any pizza you have tried anywhere unless it was at this place; I say this with 100% certainty. 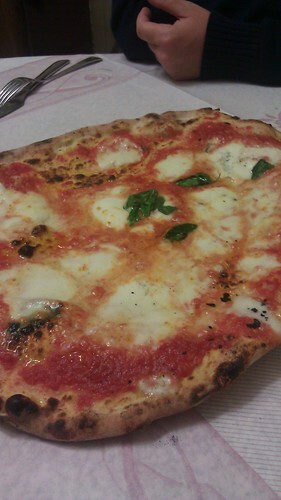 The crust was thin and chewy, sauce tangy but not overwhelming, and the mozzarella bufala creamy and delicious. It was one of the best eating experiences we have ever had. We ate at this place again a day later and would have waited as long as it took. Just a little bonus: The pizza was less than 4 Euros! The next day we were on a mission to get Jess a jacket, and shopped our way through the crowded streets. Another thing Naples is known for is clothing; that sought after Italian fashion but 30% cheaper than elsewhere in Italy. 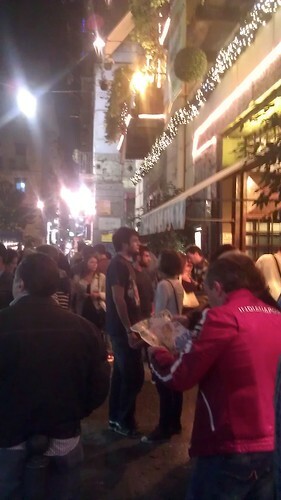 Fashion in general in Naples was kinda funny; think Park Avenue meets Jersey Shore. Jess had no luck finding a jacket, but I certainly could have spent some money. Naples is a wonderland of mens fashion. Shop after shop of hand made suits, shirts, stylish pants and cheap jeans awaited any willing buyer. I’m so used to having to look in the tiny men's section of shops dominated by ladies clothing, that this was quite a treat. That evening we had fried vegetables, another staple of Naples, and engaged in an awesome Naples experience: Public drinking. Every night tons of people gather in a small plaza surrounded by bars, restaurants and take-away shops to drink a cheap beer sitting next to 2600 year old Greek ruins. The plaza is disgusting. There is just no other way to put it. However, as you sit with 20-30-40 somethings drinking a beer in a small cloud of cigarette and marijuana smoke, Italians gesticulating wildly, laughing, and Armani clad socialites rubbing elbows with the cities homeless, you get an awesome view of humanity, and why this city is great. 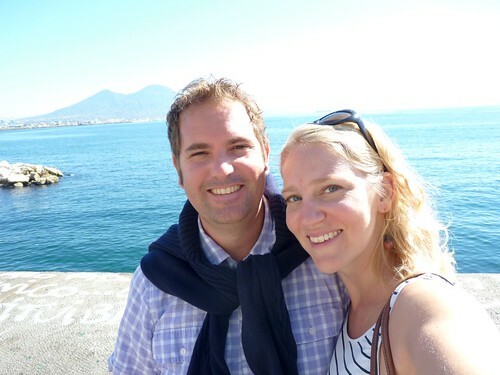 The next day we went to Pompeii. Right off the train you will find one of the largest, most intact historical sites in the modern world. In the shadow of the once great Vesuvius is road after road of homes, shops, temples, and public squares, many of which still have detailed mosaics, intact ovens and tools of the times. Jess and I were there for 4-5 hours and maybe saw half of the site. It is really amazing. We also saw the famous “people” of Pompeii, once living citizens immediately cased in ash and frozen in time. Just the scale of the ruins justifies a trip for every history buff that comes to Italy. Jess is writing a more through piece on Pompeii, so look for that! That afternoon we walked around the old city to see some of the oldest shops and trades. One kind of bizarre trade was the making of very detailed wooden figures for nativity scenes, which is fine until you see a whole street of 40 shops bursting into the street with strange masks, figures, and whole little villages in wood. They were really amazing, but kinda creeped me out. We also explored some of the more questionable parts of town, which would have made for foolish nighttime wandering. Unfortunately, the Neapolitan mafia is still a very real deal here; past certain streets were until recently the scene for gang related shootings, hands-on crime, and forced pay-offs (which are still the case). Indeed upon arrival our hostel owner showed us where not to go on the map, "best not to cross this line at Via Duomo, over there is where a lot of shootings between the families happened a few years back." Wha?! That evening we had pizza again (shocker…but common, what could we possibly get that’s better for 5$?!) and had another thing Naples knows best, espresso. Café Mexico is regarded by some as the best coffee in the world. It is very simple, strong, and quite worthy of the praise (although “best in the world” is questionable). Due to Italians setting national standards for the price of espresso at about a euro (it was getting too high due to taxation and Italians revolted) it certainly does not break the bank either. 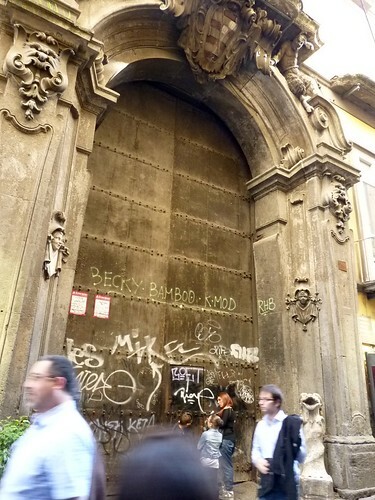 We had to leave early the next day but really wanted to stay; Naples gritty charm had worked its magic on us. There is really no way to describe the city that is Naples, but I’ll give it my best: When I think of Naples I liken it to a once exquisite armchair, now torn and soiled through years of heavy use, that you cannot bring yourself to throw out because it is so comfortable. You know that you will not find another chair to replace it, so regardless of how it looks, it will never leave your living room. I went to Naples to eat, and to eat pizza specifically. I'm happy to report, as Jon has, that we were not disappointed. Pizza plus the unending pastries, sweets, fried deliciousness, coffee and gelato at ever turn is a feast for the senses and stomach. Napoli isn't where you go to start a diet, but one shouldn't care. Eating here, and in all of Italy in fact, is such a pleasurable experience, one that deserves time and focus and I love obliging in every way. Naples' rough edge but juxtaposing style made me really feel like I was in the old world. At the same time walking around at night, with shops open late and goods pouring out of small storefronts, including kitchy home items, plastic goods, electronics and of course cloths reminded me of similar night time scenes in Dakhla, Morocco and some other small towns. Somewhat old, somewhat second-world, urban but not all the way modern, Naples has a really special vibrancy to it. Grit, grime and all, it's a place we completely loved.